Interning abroad can be a wonderful way to gain international work experience and build global networks. But to make the most of an overseas internship , you first have to find a good opportunity. Here are three important questions to consider when looking for the ideal international internship. Which country should I go to? Where you go depends on the industry you want to work in. If you hope to work in fashion, you'll probably look for opportunities in major cities; if conservation is your field of choice, you may dream of going to a rain forest instead. One of the great advantages of an international internship is that you can work in almost any industry the world has to offer, not just what's available at home. Another important consideration is language. Do you have to be proficient in your country of choice's local language before you go, or will business be conducted in English? Will learning that particular local language be beneficial to your future career? Lastly, to take an international internship, you will need to apply for a student or working visa. Regulations differ, and some countries make it easier for Americans to get visas than others. Will I get paid for my internship? There are international internships that pay, whether it's a full salary or simply a small stipend. Of course, competition for these paid positions are high, and the salary won't necessarily cover your travel costs or placement fees. Bear in mind, however, that some countries' visa regulations won't allow you to get paid work, which means you won't get any money for your internship. 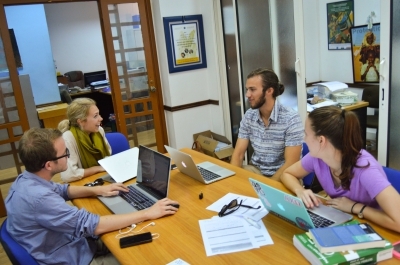 In the end, an international internship is not about making money – at least not right away. Job seekers with international interning experience may expect higher starting salaries, so taking an unpaid internship now could very well lead to more money in the future. Many universities offer credits for international internships. However, you need to make sure that your internship meets your school's specific requirements. Some colleges may even provide support and funding for interning abroad, so speak to the relevant departments before you apply. Contact Intern Abroad for more free advice on international internships.